Levi Bailey – Welcome to Excel’s Suggestion Box! @Stilez as mentioned in the comments by others on this suggestion and elsewhere, the NA() function (which returns the #N/A error) can often satisfy that use case. Ryan that's a good start, but, along with the false positives you mentioned, it misses a lot of extenal links. External links can be in defined names and shapes, commonly including charts, plus a bunch of other places that aren't springing to mind right now (and undoubtedly plenty I haven't discovered yet). Presumably the Excel team could do away with this problem once and for all. By all means feel free, but I'm not going to invest the time to create such a list as it currently stands. Shared mode is miles from where it could be. It doesn't even seem like they've had a power user put it through its paces and test why things work (or don't work) the way they do and whether the disabled functionally needs to be disabled or would be better to behave some intuitive way. In addition to the excellent suggestion by Tomas K, please consider making it easy to select a subset of sheets. It might make sense to do this with shift+click (where you click to select a start point, then shift+click on the end point and it extends the selection from the start point to the end point including everything in between). Yes, this is largely a request of hosting that experience as a new sheet tab in Excel (so the "Sheets" collection would be able to include the existing Worksheet and Chart objects as well as something like new DatabaseSheet objects). There would be no need for an equivalent to the pane at the bottom of the image (where measures are defined). There would need to be an easy way for logic to flow between Worksheets and DatabaseSheets. I hope that makes sense? Happy to try again if not. I'm not Bill but I did create the original suggestion and have looked at the 'Data Model' and 'Power Pivot' capabilities of Excel 2013. These are fantastic features however they can be overwhelming to many Excel users, so even considering these existing tools I believe that a simpler "database" sheet type would be useful. You can use the HYPERLINK function. 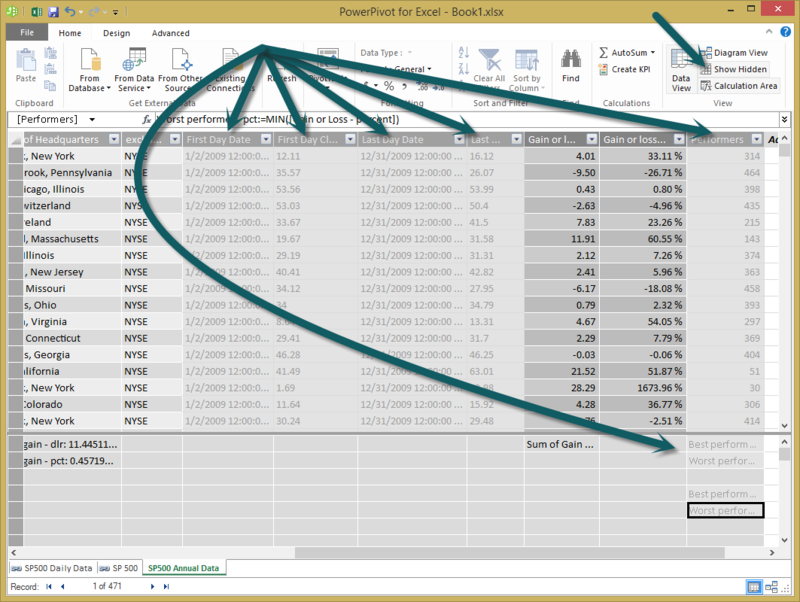 -1- Open the "Excel Options" dialogue box by clicking "File" (along the top) then "Options" (on the left). -2- Ensure that the "General" tab is active (it should be highlighted on the left, click on it if not. -3- Change the "Font size:" which is just below centre under heading "When creating new workbooks". Example: Allow us to drag buttons around the quick access toolbar and the ribbon, just like we can in the Windows taskbar. Also like the windows taskbar, having a "Lock the [quick access toolbar/ribbon]" option in the right-click menu would likely reduce issues people have with inadvertently dragging buttons around. I do realise that we can move these things around in the Customize Ribbon tab of the Excel Options dialogue box and am hoping for something quicker. I'm not sure whether naming some of these tools would be help or potentially be a legal impediment to Microsoft so generally won't do it. I am aware that Joe D from the Excel team previously created and is just giving away Spreadsheet Studio - this has useful auditing tools (not specifically what Vincent is saying but related) - maybe there is hope of working something out? For clarity I do realise that there already a Conditional Formatting Manager and am meaning to suggest for it to be replaced or greatly improved. I would like it to be easier to manage conditional formatting. (a) Visualise and change the ranges that each formula relates to. (b) See which rules are similar to one-another and consolidate where appropriate. I'd just like to echo this and note that there is some overlap of this with the "Include a Conditional Formatting Manager" and "Refine Edit mode, Enter mode and Point mode" suggestions.